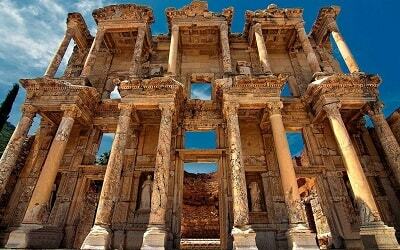 If you are already vacationing in Marmaris, but you would like to see something more of what Turkey has to offer, you should definitely visit one of our most prominent cities – Istanbul with our Marmaris Istanbul Day Trip. If you are taken aback by the distance between Marmaris and Istanbul, don’t worry. We have taken care of everything. 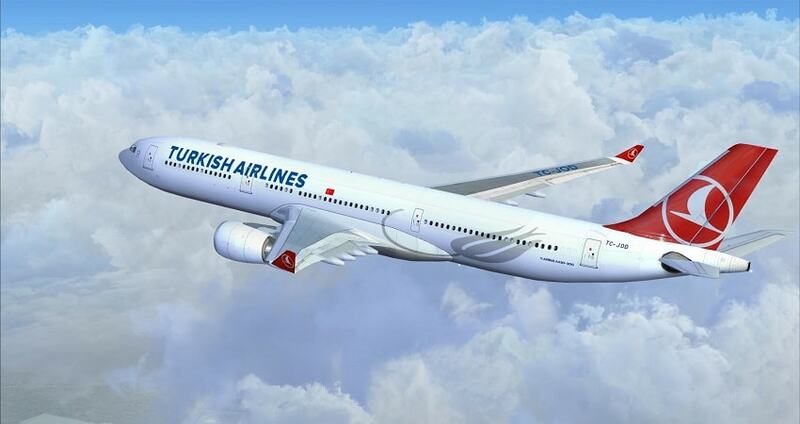 Our great journey starts with a transport from your hotel to the airport where you will board the plane to Istanbul. The flight lasts for just 45 minutes, and both hotel transfers, entrance fees, guiding services and the airplane tickets are included in the price. 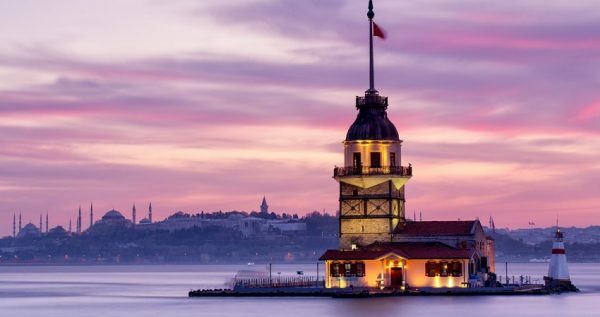 Istanbul is truly a fascinating city and one of the features that makes it unique is the fact that it’s built on two continents, Europe and Asia. Keeping that in mind it is no wonder that this beautiful city is known for its versatility in architecture, art, culture, and people in general. With 14 million people this glorious city is also the biggest city of Turkey, and one of the largest cities in the world. This lovely city is also spread on both sides of Bosporus. Istanbul basically presents a bridge over the narrow channel between the Black and the Marmara Sea, connecting Europe and Asia. 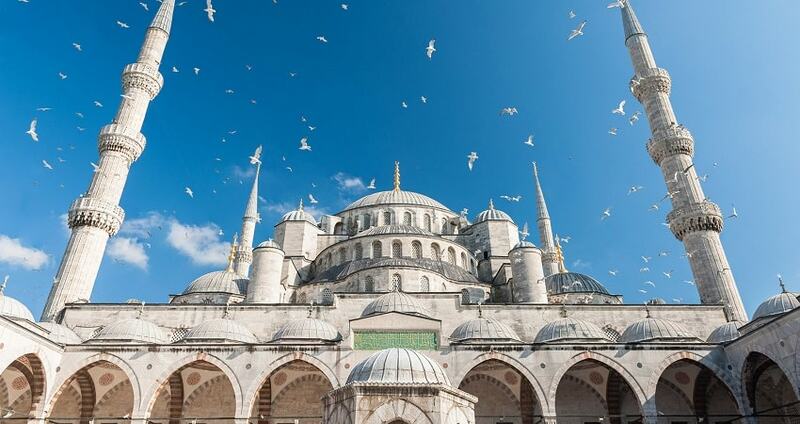 One of the first places we’ll visit while in Istanbul is the Blue Mosque. This wonderful mosque is also known as Sultan Ahmed Mosque and it is one of the most impressive Ottoman mosques in the country. The construction of this majestic mosque was ordered by Sultan Ahmet l. The mosque was designed to complement the strength of that of Hagia Sophia, which stands across Sultanahmet Square, facing the Blue Mosque. The Mosque consists of the central dome surrounded by four smaller half-domes, and four pillars known as “elephant foot” which support the whole construction. Most visitors that don’t enter the mosque would probably find the name of the mosque mind-boggling, but once you enter the name Blue Mosque seems like a logical one. The interior of this stunning mosque is decorated with more then 20,000 handcrafted Iznik tiles, which feature numerous flowers decorations such as roses, tulips, lilies, carnations and more. The mosque is all the more captivating because it has 260 windows that lit the already gorgeous space perfectly. This wonderful mosque isn’t just for show, it is a working mosque as well, so it is closed for tourists while the prayer time lasts. We also advise all of our travelers to dress respectively, but if someone forgets, shawls and other covering garments will be handed at the entrance if needed. In Marmaris Istanbul Day Trip, we will also be visiting one of the symbols of the city of Istanbul and that is the Topkapi Palace. Topkapi Palace was constructed in 1461 on top of the most visible hill which overlooks the city. The Palace’s construction was ordered by Mehmet the Conqueror, and once it was built it became a political home of the rulers of the Ottoman Empire. It remained a political base until Sultan Abdulmecid l in 1853. Topkapi Palace hosted 22 Sultans during the four centuries in between. These days Topkapi Palace is a museum, and for that matter it is the most visited museum in Turkey. Every year about three million people visits this great Palace. People come to see numerous treasured things like the famous 86 carat, Spoonmaker’s Diamond, which is the fifth largest diamond in the world. What makes this diamond all the more interesting is the story of how it was found. The fisherman who found it thought it was a piece of glass, so he traded it at the market for three spoons, and thus the name – Spoonmaker’s Diamond. One of our visits is also Spice Bazaar, also known as the Egyptian Bazaar. This charming bazaar is the most colorful and vibrant of all Istanbul’s bazaars. It was constructed in 1664 as an integral part of complex of the New Mosque. This marvelous bazaar offers pretty much any spice that you could think of. We often advise our clients to buy the spices which are typical for Tukey, so they have something to remind them of the taste of our authentic kitchen when they get home. Spices like pul biber, sumac and Nigella seeds are quite characteristic for our country so you might want to take those home with you. The bazaar also features numerous teas, herbal remedies, dried fruits, olive oil soaps, honey and numerous kinds of Turkish delights. Once Marmaris Istanbul Day Trip is over, we will drive back to the airport for a flight to Marmaris. 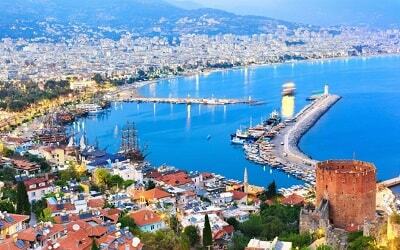 Our driver will be waiting at the Marmaris airport to take you back to your respective hotels in the city. Marmaris Istanbul Day Trip begins with a scheduled pick up. Our driver will drive you from your respective lodging in Marmaris to the airport. Our flight from Dalaman Airport to Istanbul lasts for approximately 45 minutes and the tickets are included in the primary price. 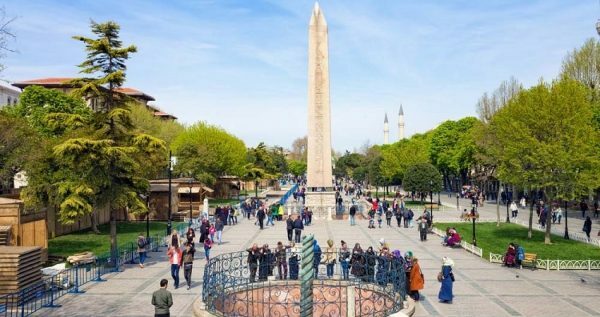 Istanbul is a fantastic city and one of the things that makes it stand out from all other big cities is the fact that it stands on two continents, Europe and Asia. So, it is no surprise that this marvelous city is known for its diversity in architecture, culture, art, as well as people of all nationalities. With more than 14 million inhabitants this splendid city is also the most populous city of Turkey, and one of the biggest cities in the whole wide world. 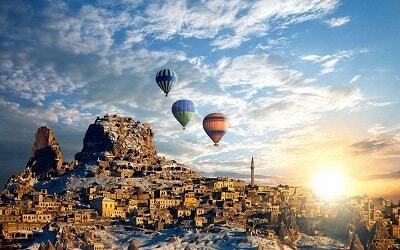 This beautiful city is also spread across both sides of narrow Bosporus. 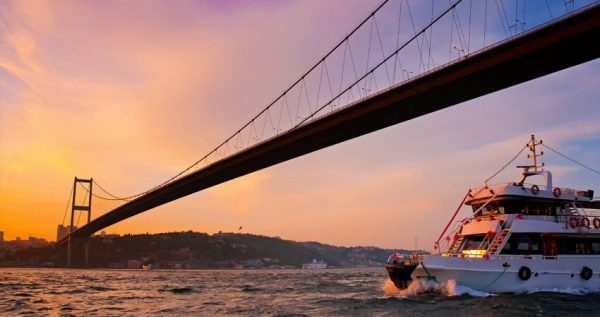 Istanbul stands as a one-of-a-kind bridge over the strait between the Marmara and the Black Sea, or between Asia and Europe. 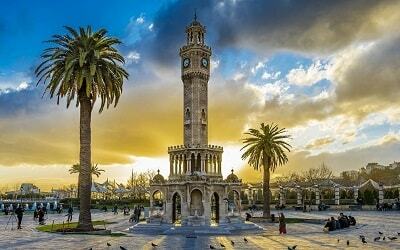 The first places we will visit in Marmaris Istanbul Day Trip is the famous Blue Mosque. This beautiful mosque is also called the Sultan Ahmed Mosque and it is one of the most stunning Ottoman mosques in the whole country. 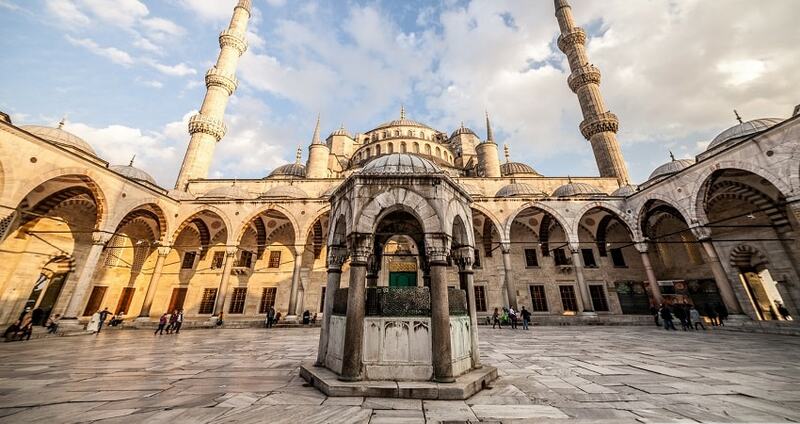 The making of this majestic mosque was instructed by Sultan Ahmet l. The mosque was made to fit the strength of the Hagia Sophia, which is situated across Sultanahmet Square, so it faces the Blue Mosque. The Mosque includes the main dome with four smaller semi-domes around it, and four supporting pillars called the “elephant foot”. 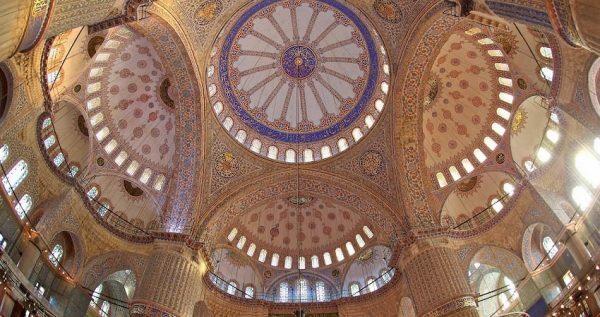 The gorgeous interior of the Blue Mosque is embellished with more than 20,000 handmade blue tiles, which have numerous decorative details such as roses, lilies, tulips, carnations and more. The mosque’ interior is even more mesmerizing because it has 260 windows that perfectly illuminate the already lovely space. This fascinating mosque is also a working mosque, so it is closed for tourist-visits while the prayer lasts. We also urge all of our guests to dress respectively. If, however someone forgets, shawls and other similar garments will be provided at the entrance. One of the major symbols of Istanbul is the marvelous Topkapi Palace. 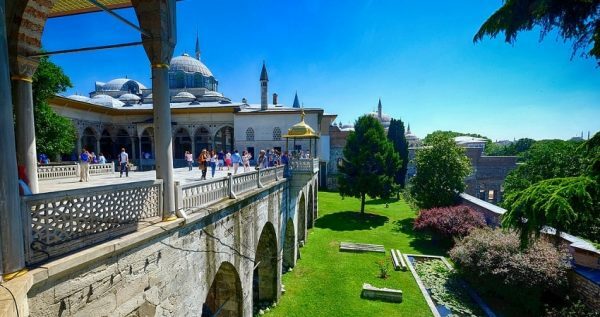 Topkapi Palace’s construction started in 1461 on top of the hill which stood out the most overlooking the city. The building of the Palace was ordered by Mehmet the Conqueror. Once the palace was built it became a vibrant political center and home of the sultans of the Ottoman Empire. It remained a politicly relevant until 1853 when Sultan Abdulmecid l decided not to use it as apolitical base any more. Topkapi Palace housed 22 Sultans within the first four centuries of its existence. 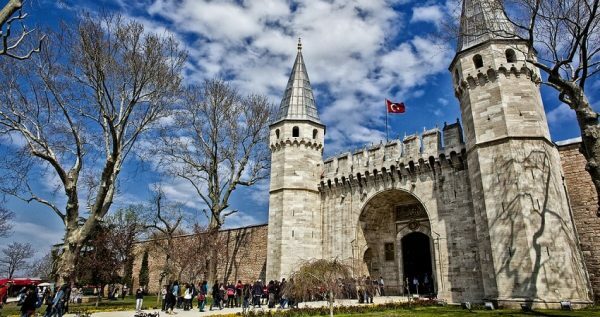 Topkapi Palace is now a renowned museum, in fact it is the most visited museum in the whole country. Every year some three million people come to see this great Palace. Things such as the famous 86 carat, Spoonmaker’s Diamond, are always interesting. This marvelous diamond is the fifth biggest diamond in the whole world, and the story of its strange name is now legendary. Apparently, the fisherman who discovered it thought it was just glass, so he exchanged it at the jewelry market for three spoons. That is how this gem got its name – the Spoonmaker’s Diamond. 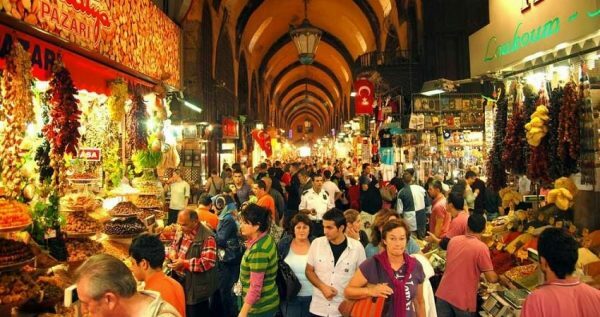 One of our top visits in Marmaris Istanbul Day Trip is a visit to the Spice Bazaar, which is also called the Egyptian Bazaar. This colorful bazaar is the most vibrant of all Istanbul’s markets. It was created in 1664 as an important part of the land of the New Mosque. This terrific bazaar has all of the spices that you could possibly think of. We usually advise our clients to purchase the spices typical for Tukey. That way you will have a vivid reminder of our authentic kitchen when you get home. Spices like sumac, Nigella seeds and Pul Biber are characteristic for our country’s cuisine, so you might want to opt for the likes of them. The Spice Bazaar also offers numerous teas, dried fruits, olive oil soaps, herbal remedies, honey, a wide variety of Turkish sweets, and much more. Once Marmaris Istanbul Day Trip is over, we will go back to the airport to board the flight to Marmaris. Once we land, our driver will already be waiting at the airport to take you back to your respective accommodations in Marmaris. Marmaris Istanbul Day Trip price includes transportation from hotel to airport and back, both plane tickets, all entrance fees, full insurance package, guide who speak English.